The Andrei Gerlach Craftsman Collection Series Chaconne Cello is inspired by hand-carved instruments made by the Italian masters. The Chaconne is a cello marked by its fine attention to detail and well-balanced tonal qualities, with a seasoned spruce top, maple back and sides. 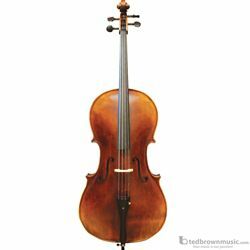 It is a great addition for any musician with a decorative tailpiece and boxwood fittings.